Chrono Trigger was one of the greatest RPGs ever to be released, and helped to bring RPGs more into the spotlight on American soil. It is still hailed as a classic and remains a favorite in the hearts of fans everywhere. Now, four years after its release, a sequel has finally been announced. 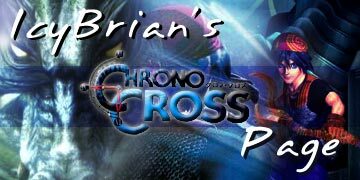 Entitled Chrono Cross, it was released for the Playstation in Winter 1999 in Japan, and on August 15th, 2000 in America. Yes, I realize that I haven't updated the information on this page in a while. I concentrate on updating fanfics and fan art; if you're looking for information, you can find that at Game FAQs. This page was last updated on May 13th, 2002. Many thanks to YoshiGeno for the logo. This is a non-profit, non-commercial page. Chrono Cross © by Squaresoft. Except for the topic, this page is not connected to Squaresoft in ANY way. Thanks to GIA for their help with some of the info and media.